Carnegie Hall’s Weill Music Institute each summer chooses the country’s most talented young musicians to form the National Youth Orchestra of the United States of America (NYO-USA). 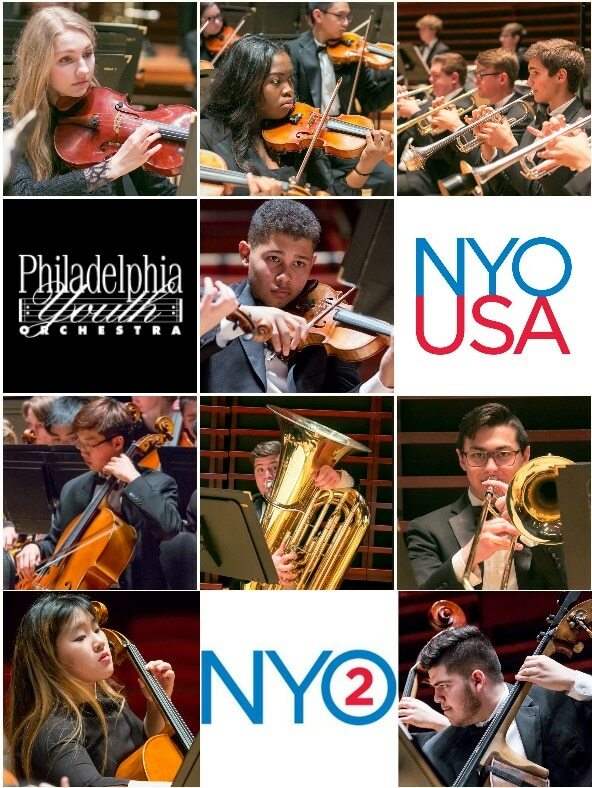 This year, seven Philadelphia Youth Orchestra (PYO) students have been selected to participate in the prestigious NYO-USA, and two students have been selected to participate in its sister ensemble for younger students: NYO2. The PYO students who have been chosen from PA are: Akili Farrow, violin, of Southwest Philadelphia; Johnny May, violin, of Penn Valley; Noah Stein, trombone, of Yardley; Sabine Young (NYO2), cello, of West Chester; and Gregory Padilla (NYO2), bass, of Northeast Philadelphia. The students from NJ are: Clara Bouch, viola, of Cherry Hill; Robin Park, cello, of Princeton Junction; and David Stein, tuba, of Morristown. NYO-USA returns to Asia in summer 2018 with conductor Michael Tilson Thomas leading a program to include the world premiere of a new Carnegie Hall–commissioned work by composer Ted Hearne, Sibelius’s Symphony No. 2, and Gershwin’s Piano Concerto in F Major featuring acclaimed pianist Jean-Yves Thibaudet as soloist. The musicians’ summer begins with a three-week rigorous training residency, working with leading professional orchestra players from across the country, leading up to NYO-USA’s annual concert on Carnegie Hall’s illustrious stage (July 19), to be heard by music lovers worldwide via the Carnegie Hall Live broadcast and digital series, created in partnership with 105.9 WQXR. Tickets for the Carnegie Hall performance are on sale now at the Carnegie Hall Box Office, 154 West 57th Street, by calling CarnegieCharge at 212-247-7800, or at carnegiehall.org. Following their New York appearances, the NYO-USA musicians will fly to Asia for a tour of some of the region’s music capitals, including visits to Taipei, Shanghai, Beijing, Seoul, and Daejeon. This tour builds on NYO-USA’s historic inaugural tour to China in July 2015, which included seven concerts and was recognized as one of the only four Cultural Pillars of the Consultation on People to People Exchange (CPE) between the USA and China. This summer’s tour includes debut performances in Taipei and South Korea. NYO-USA players will also have the chance to tour each city and experience the richness of Asian culture. Outstanding younger American instrumentalists form NYO2, a free orchestra program that comes together alongside NYO-USA each summer with intensive training and performance opportunities. This summer, participating musicians have the opportunity to work closely with fellows of the New World Symphony as well as top players from American orchestras during a residency before NYO2’s performances. After two weeks of training, the 2018 program culminates in a six-day residency at the New World Center in Miami, performing with members of the New World Symphony and violinist Gil Shaham under the direction of conductor Carlos Miguel Prieto in a concert to be webcast by medici.tv. Upon return to New York, this esteemed group of musicians will present their program at Carnegie Hall (July 24), including music by Reveultas, Prokofiev, and Shostakovich. Tickets for the Carnegie Hall performance on July 24 are on sale now at the Carnegie Hall Box Office, 154 West 57th Street, by calling CarnegieCharge at 212-247-7800, or at carnegiehall.org. Each summer, Carnegie Hall’s Weill Music Institute brings together the finest young musicians from across the country (ages 16-19) to form the National Youth Orchestra of the United States of America (NYO-USA). Following a comprehensive audition process and a three-week training residency at Purchase College, State University of New York, with faculty made up of principal players from top professional orchestras, these remarkable teenagers embark on a tour to some of the great music capitals of the world, serving as America’s dynamic music ambassadors. Launched in summer 2013 to great acclaim, the first-ever National Youth Orchestra of the USA presented concerts with conductor Valery Gergiev and violinist Joshua Bell to enthusiastic audiences at the Kennedy Center in Washington DC; St. Petersburg and Moscow in Russia; and at the BBC Proms in London. The 2014 orchestra, led by American conductor David Robertson with violinist Gil Shaham as soloist, made its debut at Carnegie Hall in New York City, followed by a coast-to-coast US tour. In 2015, NYO-USA, with conductor Charles Dutoit and pianist YUNDI, made its debut in China, performing at some of the country’s greatest concert halls, including stops in Beijing, Shanghai, Suzhou, Xi’an, Shenzhen, Guangzhou, and Hong Kong. In 2016, the orchestra performed with conductor Christoph Eschenbach and pianist Emanuel Ax at Carnegie Hall before embarking on a European tour with Valery Gergiev and Denis Matsuev. Last summer, the orchestra traveled to Latin America for the first time, performing in Guadalajara, Mexico, Quito, Ecuador, and Bogotá, Colombia under the direction of Marin Alsop. www.carnegiehall.org/nyousa. Created by Carnegie Hall’s Weill Music Institute in summer 2016, NYO2 brings together outstanding young American instrumentalists ages 14–17 for a summer orchestral training program with a particular focus on attracting talented students from groups underserved by and underrepresented in the classical orchestral field. Running in conjunction with NYO-USA’s annual summer residency at Purchase College, SUNY, NYO2 offers an opportunity for participants to play alongside exceptionally talented peers and learn from a world-class faculty. The program aims to expand the pool of young musicians across the country equipped with the tools to succeed at the highest level, particularly those who will bring greater diversity to classical orchestral music or those who have not had access to highly selective training opportunities through major youth orchestra programs, summer festivals and camps, or similar experiences outside of their local community. The inaugural season of NYO2 culminated in a side-by-side concert with The Philadelphia Orchestra at Philadelphia’s Verizon Hall led by conductor Giancarlo Guerrero. In summer 2017, the members of NYO2 made their Carnegie Hall debut with Guerrero, members of The Philadelphia Orchestra, and Grammy Award–winning bassist and vocalist Esperanza Spalding. This year, NYO2 partners with the New World Symphony for the first time for a six-day residency in Miami Beach and their concert at Carnegie Hall.